To the east of the Sea of Galilee across from Kibbutz Ein Gev is a road off the main highway <92> that passes beside a field of banana plants and winds its way onto the Golan plateau just south of Afik. About halfway, to the left of the road is a hill and on its summit (350 meters above the lake) the remains of the Byzantine city of Sussita (known as Hippos in its earlier Hellenistic incarnation). With General Pompey’s conquest of Sussita in 63BCE it became one of the cities of the Decapolis, a group of ten cities on the eastern frontier of the Roman empire, grouped together because of their language, culture, location, and political status (each had a certain degree of autonomy and self-rule, for example, Sussita was allowed to mint its own coinage with a symbol of a horse). The Decapolis cities were centers of Greek and Roman culture in a region that was otherwise Semitic (Nabatean, Aramean, and/or Jewish). According to Josephus, Hippos had a mixed population of Christians, pagans and Jews. Of the ten cities, eight are in Jordan and two, Bet Shean and Sussita are in present day Israel. The earliest survey and excavations, date back to the work done in the late 19th century by Gottlieb Schumacher (the German Templer railway engineer) and that of archeologist Claire Epstein in the 1950s. The University of Haifa (in conjunction with Concordia University of Minnesota and the Polish Academy of Sciences) will be excavating for their 12th season this summer. Sussita is a remarkable archaeological site and yet is virtually unknown and unvisited; a guide will help you discover little known places and explain them. 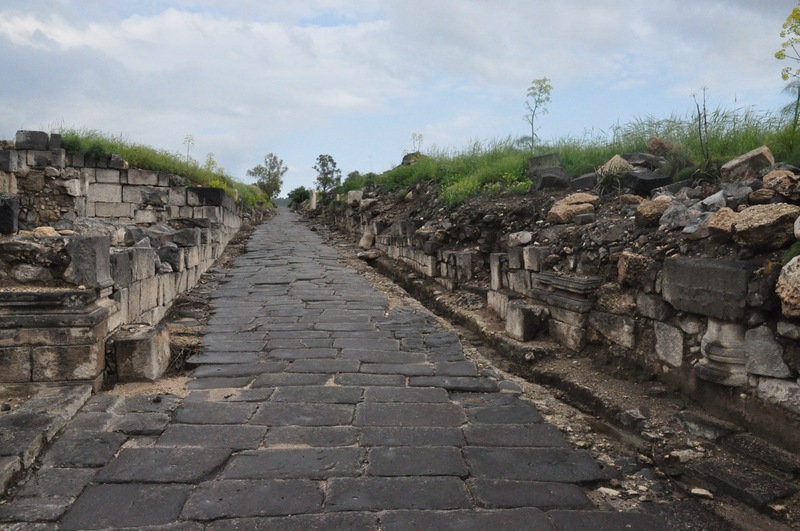 It is quite different from other cities, for example, most of the building and the street paving stones are of black basalt (rather than white limestone), the main Roman street that runs for a total length of about 500 meters like a spine across the top of the site is not the usual Cardo but actually the Decumanus. As you walk up the path towards the site the first thing you come to is the east gate. It had a tower on each side, one round and one square – a unique feature (most towers are the same). The round tower is well built of accurately cut basalt stones laid without the use of mortar. The square tower is poorly formed and preserved, and seems to have been repaired with cement at a later stage. Just inside the gate you can see two interlocking stone rings part of an ingenious water system built by the Romans. Originally Sussita collected its water from rainfall that was stored in a large underground vaulted cistern 9 meters deep at the western end of the city; smaller cisterns have been uncovered under other buildings. When this was insufficient for the needs of the growing city the Romans built an aqueduct starting from the waterfall in Nahal El-Al (btw this is a great hike) about 25 kilometers away. The problem was how to get it across the valley and up into the city. 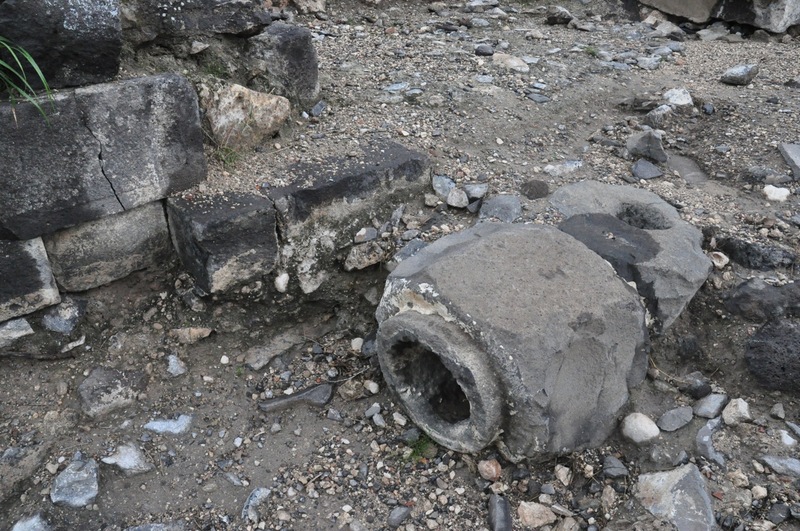 The Romans engineered a pipe made up of interlocking stone rings, made airtight with caulking, in which the water flowed down into the valley and then was drawn up into the city by siphonic action (like sucking a hose to siphon gas from your tank into a container) – the first time in this region. On the left side is the South-East Church, also called the Cathedral, the largest and most magnificent of the eight churches uncovered in Sussita. 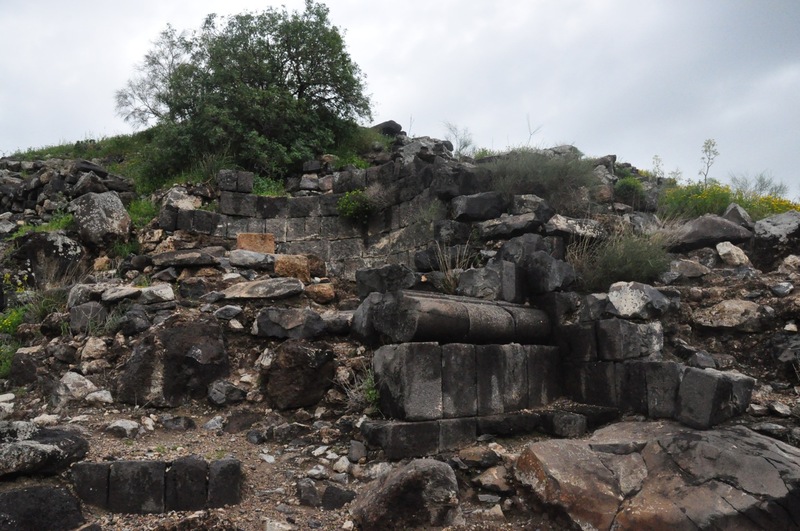 It was excavated by Claire Epstein, as a rescue dig during the years 1951-1955 when the IDF fortified the hill against clashes with the Syrian army. 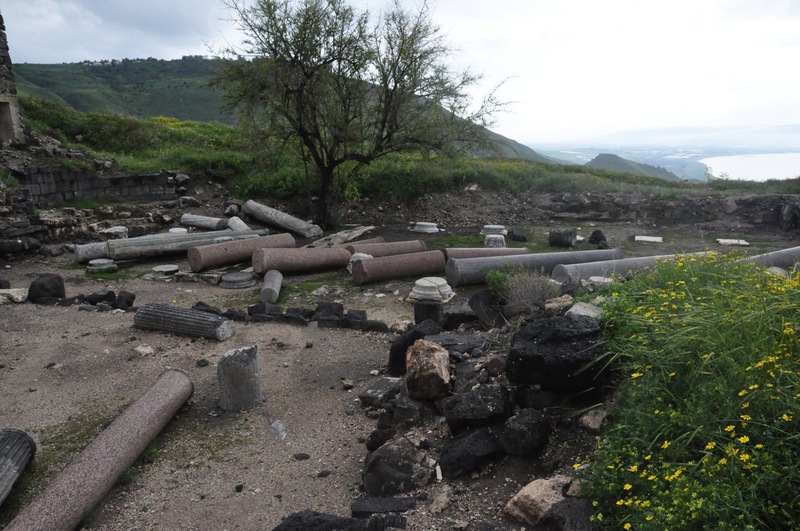 Like at Beit Shean, the columns have been toppled over (like a row of wine bottles on a table covered by a tablecloth when the cloth is yanked), each one parallel to its neighbor, by the earthquake of 749CE . Continuing along the Decumanus, one arrives at the forum on the south (left) side and opposite it, the Hellenistic (third century BCE) compound on the north side. At one end of the forum, there appears to have been a triumphal arch, marking the crossroads with the Cardo (the “heart”). Next to the arch is a monumental building (dated to the third century CE) which may have been a nymphaeum, the major water distribution point, but as no pipes or basins were found here, it could also have been part of an open-air shrine. 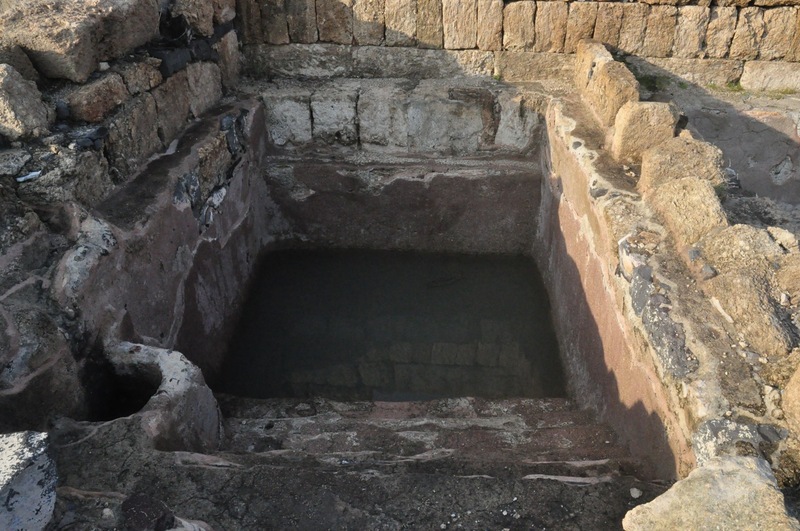 On the south side of the Northwest Church are two rectangular pools, the walls are plastered and there are steps leading down to the bottom. They look like they could be ritual baths (mikve) but actually these basins were used to collect grape juice. Next to the basins is a large area, the treading floor, where the grapes were placed and crushed by the feet of the workers in order to extract their juice. Besides three wine presses in the area there is also an oil press and storage area for agriculture products used by the priests and monks. In 2009 archaeologists identified the Roman public structure to the west of the forum that had puzzled them – an Odeon (in Greek, to sing), a roofed mini-theater with about 600 seats used for musical shows and poetry reading, the first to be discovered in Israel. One of the most recent discoveries at Herodium was a small Roman theater and loggia on the other side of the main staircase, across from the tomb area. It would be interesting to compare these two theaters. Although we know that Jews were a minority living in the city so far no synagogue has been found. An eagle-carved lintel, typical of a synagogue (perhaps originally from a synagogue and re-used), was found on the west side of the hill, but it turned out to be another church, the Southwest Church (read the post about the Byzantine church recently uncovered at Hirbet Midras that scholars thought was a synagogue because of the lintel). Sussita and Bet Shean, both cities of the Decapolis; small theaters, synagogues and churches, aquaducts at Sussita and Herodium; earthquakes that levelled cities until archaeologists re-discovered them – there is much to experience with a guide. This entry was posted in Archaeology, Architecture, Water and tagged postaweek2011 on June 23, 2011 by Shmuel Browns. Thanks, this is fantastic, a great site that few visit!